"American settlers" redirects here. For prehistoric settlers of the Americas, see Settlement of the Americas. 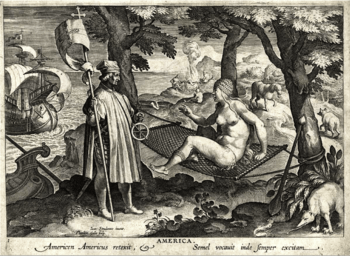 European colonization of the Americas began as early as the 10th–11th century, when West Norse sailors explored and briefly settled limited areas on the shores of present-day Canada. These Vikings were Icelanders who had discovered and settled Greenland, then sailed up the Arctic region of North America alongside Greenland, and down alongside Canada to explore and settle. According to Icelandic Sagas, violent conflicts with the indigenous population ultimately made the Norse abandon those settlements. Extensive European colonization began in 1492, when a Spanish expedition headed by Christopher Columbus sailed west to find a new trade route to the Far East but inadvertently landed in what came to be known to Europeans as the "New World". Running aground on the northern part of Hispaniola on December 5, 1492, which the Taino people had inhabited since the 7th century, the site became the first European settlement in the Americas. European conquest, large-scale exploration, colonization and industrial development soon followed. Columbus' first two voyages (1492–93) reached the Bahamas and various Caribbean islands, including Hispaniola, Puerto Rico and Cuba. In 1497, sailing from Bristol on behalf of England, John Cabot landed on the North American coast, and a year later, Columbus's third voyage reached the South American coast. As the sponsor of Christopher Columbus's voyages, Spain was the first European power to settle and colonize the largest areas, from North America and the Caribbean to the southern tip of South America. 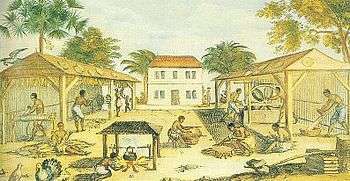 Other powers such as France also founded colonies in the Americas: in eastern North America, a number of Caribbean islands, and small coastal parts of South America. Portugal colonized Brazil, tried colonizing of the coasts of present-day Canada, and settled for extended periods northwest (on the east bank) of the River Plate. The Age of Exploration was the beginning of territorial expansion for several European countries. Europe had been preoccupied with internal wars, and was slowly recovering from the loss of population caused by the bubonic plague; thus the rapid rate at which it grew in wealth and power was unforeseeable in the early 15th century. Eventually, the entire Western Hemisphere came under the ostensible control of European governments, leading to profound changes to its landscape, population, and plant and animal life. In the 19th century alone over 50 million people left Europe for the Americas. The post-1492 era is known as the period of the Columbian Exchange, a dramatically widespread exchange of animals, plants, culture, human populations (including slaves), communicable disease, and ideas between the American and Afro-Eurasian hemispheres following Columbus's voyages to the Americas. Norse journeys to Greenland and Canada are supported by historical and archaeological evidence. A Norse colony in Greenland was established in the late 10th century, and lasted until the mid 15th century, with court and parliament assemblies (þing) taking place at Brattahlíð and a bishop located at Garðar. The remains of a Norse settlement at L'Anse aux Meadows in Newfoundland, Canada were discovered in 1960 and were dated to around the year 1000 (carbon dating estimate 990–1050 CE), L'Anse aux Meadows is the only site widely accepted as evidence of pre-Columbian trans-oceanic contact. It was named a World Heritage site by UNESCO in 1978. 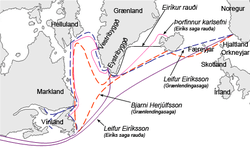 It is also notable for its possible connection with the attempted colony of Vinland, established by Leif Erikson around the same period or, more broadly, with the West Norse colonization of the Americas. 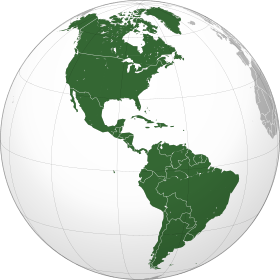 Central America & Caribbean sovereignty 1700–present. South America territorial sovereignty 1700–present. Spanish conquistador Hernán Cortés took over the Aztec Kingdom and Francisco Pizarro conquered the Inca Empire. As a result, by the mid-16th century, the Spanish Crown had gained control of much of western South America, Central America and southern North America, in addition to its earlier Caribbean territories. Over this same timeframe, Portugal claimed lands in North America (Canada) and colonized much of eastern South America, naming it Santa Cruz and Brazil. Amerigo Vespucci, working for Portugal in voyages from 1497 to 1513, established that Columbus had reached a new set of continents. Cartographers still use a Latinized version of his first name, America, for the two continents. 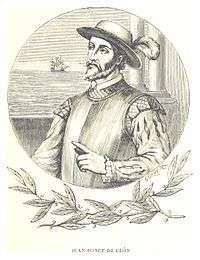 Other explorers included Giovanni da Verrazzano, sponsored by France in 1524; the Portuguese João Vaz Corte-Real in Newfoundland; João Fernandes Lavrador, Gaspar and Miguel Corte-Real and João Álvares Fagundes, in Newfoundland, Greenland, Labrador, and Nova Scotia (from 1498 to 1502, and in 1520); Jacques Cartier (1491–1557), Henry Hudson (1560s–1611), and Samuel de Champlain (1567–1635), who explored Canada. A relatively common misconception is that a small number of conquistadores conquered vast territories, aided only by disease epidemics and their powerful caballeros. In fact, recent archaeological excavations have suggested a vast Spanish-Indian alliance numbering in the hundreds of thousands. Hernán Cortés eventually conquered Mexico with the help of Tlaxcala in 1519–1521, while the conquest of the Incas was carried out by some 40,000 Incan renegades led by Francisco Pizarro in between 1532 and 1535. When in May 1493, the Pope Alexander VI issued the Inter caetera bull granting the new lands to the Kingdom of Spain, he requested in exchange an evangelization of the people. Thus, during Columbus's second voyage, Benedictine friars accompanied him, along with twelve other priests. As slavery was prohibited between Christians, and could only be imposed in non-Christian prisoners of war or on men already sold as slaves, the debate on Christianization was particularly acute during the 16th century. In 1537, the papal bull Sublimis Deus definitively recognized that Native Americans possessed souls, thus prohibiting their enslavement, without putting an end to the debate. 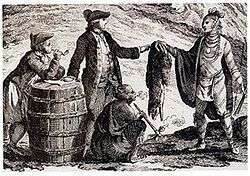 Some claimed that a native who had rebelled and then been captured could be enslaved nonetheless. It took strong leaders, like John Smith, to convince the colonists of Jamestown that searching for gold was not taking care of their immediate needs for food and shelter and the biblical principle that "he who will not work shall not eat" (see 2 Thessalonians 3). The extremely high mortality rate was quite distressing and cause for despair among the colonists. Tobacco later became a cash crop, with the work of John Rolfe and others, for export and the sustaining economic driver of Virginia and the neighboring colony of Maryland. From the beginning of Virginia's settlements in 1587 until the 1680s, the main source of labor and a large portion of the immigrants were indentured servants looking for new life in the overseas colonies. During the 17th century, indentured servants constituted three-quarters of all European immigrants to the Chesapeake region. Most of the indentured servants were teenagers from England with poor economic prospects at home. Their fathers signed the papers that gave them free passage to America and an unpaid job until they became of age. They were given food, clothing, housing and taught farming or household skills. American landowners were in need of laborers and were willing to pay for a laborer’s passage to America if they served them for several years. By selling passage for five to seven years worth of work they could then start out on their own in America. Many of the migrants from England died in the first few years. Roman Catholics were the first major religious group to immigrate to the New World, as settlers in the colonies of Portugal and Spain (and later, France) belonged to that faith. English and Dutch colonies, on the other hand, tended to be more religiously diverse. Settlers to these colonies included Anglicans, Dutch Calvinists, English Puritans and other nonconformists, English Catholics, Scottish Presbyterians, French Huguenots, German and Swedish Lutherans, as well as Quakers, Mennonites, Amish, Moravians and Jews of various nationalities. Many groups of colonists went to the Americas searching for the right to practice their religion without persecution. The Protestant Reformation of the 16th century broke the unity of Western Christendom and led to the formation of numerous new religious sects, which often faced persecution by governmental authorities. In England, many people came to question the organization of the Church of England by the end of the 16th century. One of the primary manifestations of this was the Puritan movement, which sought to "purify" the existing Church of England of its many residual Catholic rites that they believed had no mention in the Bible. A strong believer in the notion of rule by divine right, Charles I, King of England and Scotland, persecuted religious dissenters. Waves of repression led to the migration of about 20,000 Puritans to New England between 1629 and 1642, where they founded multiple colonies. Later in the century, the new Pennsylvania colony was given to William Penn in settlement of a debt the king owed his father. Its government was set up by William Penn in about 1682 to become primarily a refuge for persecuted English Quakers; but others were welcomed. Baptists, Quakers, German and Swiss Protestants and Anabaptists flocked to Pennsylvania. The lure of cheap land, religious freedom and the right to improve themselves with their own hand was very attractive. The total slave trade to islands in the Caribbean, Brazil, Mexico and to the United States is estimated to have involved 12 million Africans. 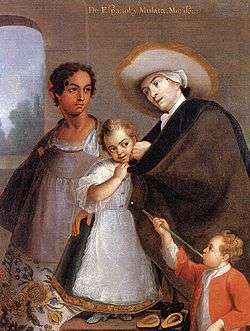 The vast majority of these slaves went to sugar colonies in the Caribbean and to Brazil, where life expectancy was short and the numbers had to be continually replenished. At most about 600,000 African slaves were imported into the U.S., or 5% of the 12 million slaves brought across from Africa. Life expectancy was much higher in the U.S. (because of better food, less disease, lighter work loads, and better medical care) so the numbers grew rapidly by excesses of births over deaths, reaching 4 million by the 1860 Census. From 1770 until 1860, the rate of natural growth of North American slaves was much greater than for the population of any nation in Europe, and was nearly twice as rapid as that of England. Drawing accompanying text in Book XII of the 16th-century Florentine Codex (compiled 1540–1585), showing Nahua of conquest-era central Mexico suffering from smallpox. The European lifestyle included a long history of sharing close quarters with domesticated animals such as cows, pigs, sheep, goats, horses, and various domesticated fowl, from which many diseases originally stemmed. Thus, in contrast to the indigenous people, Europeans had developed a richer endowment of antibodies. The large-scale contact with Europeans after 1492 introduced novel germs to the indigenous people of the Americas. Hispaniola (1493-1865); the island currently comprising Haiti and the Dominican Republic, under Spanish rule in whole or in part from 1492-1865. ↑ Pálsson, Hermann (1965). The Vinland sagas: the Norse discovery of America. Penguin Classics. p. 28. ISBN 0-14-044154-9. Retrieved 2010-04-15. 1 2 3 Taylor, Alan (2001). American Colonies. New York: Penguin Books. ISBN 9780142002100. ↑ T. Douglas Price (2015). Ancient Scandinavia: An Archaeological History from the First Humans to the Vikings. Oxford University Press. p. 321. ISBN 978-0-19-023198-9. ↑ S. A. Wurm; Peter Mühlhäusler; Darrell T. Tyron (1996). Atlas of Languages of Intercultural Communication in the Pacific, Asia, and the Americas. Walter de Gruyter. p. 1048. ISBN 978-3-11-013417-9. ↑ Linda S. Cordell; Kent Lightfoot; Francis McManamon; George Milner (30 December 2008). Archaeology in America: An Encyclopedia: An Encyclopedia. ABC-CLIO. pp. 82–. ISBN 978-0-313-02189-3. ↑ John Logan Allen (2007). North American Exploration. U of Nebraska Press. p. 27. ISBN 0-8032-1015-9. ↑ Axel Kristinsson (2010). Expansions: Competition and Conquest in Europe Since the Bronze Age. ReykjavíkurAkademían. p. 216. ISBN 978-9979-9922-1-9. ↑ "1536 Inca Rebellion unearthed | Peruvian Travel Trends". Ferturperu.info. 2009-09-22. Retrieved 2010-06-30. ↑ Conquest in the Americas. Archived from the original on 2009-10-31. ↑ "The Columbian Mosaic in Colonial America" by James Axtell Archived March 17, 2008, at the Wayback Machine. ↑ "The Spanish Colonial System, 1550–1800. Population Development". Archived from the original on February 4, 2009. Retrieved 4 October 2014. ↑ Brocklehurst, "The Banker who Led Scotland to Disaster". ↑ John Chester Miller (1966). The First Frontier: Life in Colonial America. University Press of America. p. 80. ↑ "Encyclopædia Britannica's Guide to Black History". Britannica.com. Retrieved 2014-02-28. ↑ Ronald Segal (1995). The Black Diaspora: Five Centuries of the Black Experience Outside Africa. New York: Farrar, Straus and Giroux. p. 4. ISBN 0-374-11396-3. It is now estimated that 11,863,000 slaves were shipped across the Atlantic. [Note in original: Paul E. Lovejoy, "The Impact of the Atlantic Slave Trade on Africa: A Review of the Literature," in Journal of African History 30 (1989), p. 368.] ... It is widely conceded that further revisions are more likely to be upward than downward. ↑ "Quick guide: The slave trade". bbc.co.uk. March 15, 2007. Retrieved 2007-11-23. ↑ Michael Tadman, "The Demographic Cost of Sugar: Debates on Slave Societies and Natural Increase in the Americas," The American Historical Review Dec. 2000 105:5 online Archived November 23, 2011, at the Wayback Machine. ↑ Includes 10,000 to Spanish Louisiana before 1803. ↑ Baten, Jörg (2016). A History of the Global Economy. From 1500 to the Present. Cambridge University Press. p. 163. ISBN 9781107507180. ↑ American Indian Epidemics Archived February 14, 2015, at the Wayback Machine. ↑ "Smallpox: Eradicating the Scourge". Bbc.co.uk. Retrieved 2014-02-28. ↑ Mann, Charles C. (2005). 1491: New Revelations of the Americas Before Columbus. Knopf. pp. 106–109. ISBN 1-4000-3205-9. ↑ "The Story Of... Smallpox". Pbs.org. Retrieved 2014-02-28. ↑ "Jamestown, Québec, Santa Fe: Three North American Beginnings". National Museum of American History, Smithsonian Institution. Retrieved 4 April 2012.